Walking quadrupedally on thin and flexible arboreal supports presents considerable mechanical challenges. While standing on top of a relatively thin cylindrical support, the tendency of the body of the animal is to pitch or roll (Cartmill, 1985). Pitching and rolling will have the tendency to move the body's center of mass away from the margins of the narrow substrate, toppling the animal from the support (Figure 5.1 in Cartmill, 1985). One way to counteract pitching and rolling effects on a thin substrate is to generate torques equal and opposite using grasping extremities (Cartmill, 1974a, 1985; Napier, 1967; Preuschoft et al., 1995). The ability to grasp a thin support with the hands and feet is proportional to the length of the digits relative to the palm or sole (Lemelin, 1996, 1999; Napier, 1993; Washburn, 1951). Longer proximal and middle phalanges relative to the metapodials enable the digital portion of the ray to encircle completely a thin arboreal support by the action of the long flexor tendons and intrinsic muscles, thus providing a firm, powerful grip necessary to keep in check the unwanted torques described above (Lemelin, 1996, 1999; Fig. 2a). Similarly, longer phalanges relative to the metacarpals increase the potential of the hand to achieve prehensile grips (i.e., the ability to hold and retain an object from the pull of gravity with a single hand (Napier, 1961)) (Lemelin, 1996, 1999; Lemelin and Grafton, 1998). Figure 2. Digit kinematics on a thin branch (A) and on the ground (B) during a quadrupedal walking step in opossums. The top figures show a posterior view of pedal ray V, from the moment the sole strikes the thin pole to about mid-support (based on video data of Caluromysphilander collected by the authors). The arrow in A indicates the movement of flexion at the metatarsophalangeal and proximal interphalangeal joints necessary to achieve a firm, powerful grip by completely encircling of the thin support. 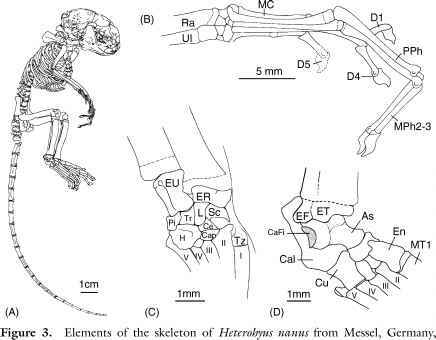 The bottom figures show a lateral view of the manual ray III, from the moment the palm strikes the flat surface to about mid-support (based on video data of Monodelphis domestica collected by the authors and cineradiography data of Didelphis marsupialis published by Jenkins (1971)). The arrow in B shows the direction of travel during which movement of extension (and hyperextension) occurs at the metacarpophalangeal and interphalangeal joints as the digit is lifted from the substrate. McClearn, 1992), which show that more terrestrial taxa sport relatively shorter digits compared to more arboreal taxa, as well as the more general observation of relative digit length reduction across mammals with the adoption of more cursorial locomotor habits (Howell, 1944; Smith and Savage, 1956). On the basis of the functional model presented above, as well as the behavioral and ecological data presented in the previous section, we can make the following predictions: Marmosa and Caluromys, which spend more time moving and foraging on thin branches, should have more prehensile extremities (i.e., longer digits relative to the palm or sole) compared to Monodelphis, Didelphis, and Philander, which spend more time moving and foraging on the ground. When comparing hand and foot proportions, Marmosa and Caluromys should fall closer to cheirogaleids than more terrestrial didelphids.